What material is used for the handle? 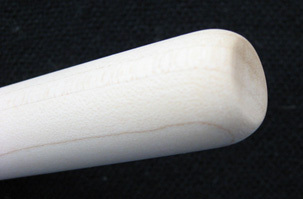 The handle is made of Hard Maple (saccharum ssp) country of origin Canada. What material is used for the bristles? Pencil One, Crease One : blue squirrel bristles. The bristles are labeled cruelty free by the manufacture. Will the logo rub off? The logos were printed using the most durable techniques available in the manufacture, they are unlikely to rub off, however, even with the best techniques, the manufacture cannot guarantee a life long durability. Can I use these brushes with cream or liquids? Pencil One and Crease One can only be used with powder products. The brushes that are made with brown dyed Saikoho goat (Worker One, Builder One) can be used with any product. However, the artisans are afraid that creams and liquids on those bristles may lead to bleeding of the bristles, it is very unlikely as the dye is used in small quantities and is very stable, I used both the Builder and Worker brushes with any type of product and never had issues. Do you have any special recommendation on how to care for these brushes? The brushes can be washed with your usual brush soap and lukewarm water. They have to be rinsed thouroughly and the excess water has to be removed gently before drying them flat or upside down. The handles have a special coating so it's recommended not to use strong alcohol on them or to hit them against a hard surface. Are these brushes Limited Edition? I hope not 🙂 and I hope I can keep producing them with the artisans. Disclaimer: I am constantly working on improving the brushes, so if a brush changes slightly it should only be for the best. Will the brushes be sold individually? The brushes will also be sold individually, the first ones should start in January 2018. Are they more brushes in the collection? Yes.. more shapes and other brushes will come in the future. Are the brushes for beginners? There is a learning curve with some of the brushes, sometimes they require a special technique (for ex. pat instead of swipe for the Builder One), they also tend pick up a lot of product, so the first approach should be made with care, however, I believe it takes one application to adopt them. Are they designed to work best with a certain type of products or technique? They will work with various finishes or techniques, it will depend on each brush, specific details and how to recommendations are under each brush post. I'd rather work the products into the skin for a polished type of application, as a result, these brushes are on the denser side. With most of these shapes, the application will be quite directional, the placement is done with a lot of control and the blending required will be minimized. The eye brushes are very efficient with sheer matte shadows and shimmers or metallics, this is something that was really important to me and I wanted brushes that could handle them effortlessly.